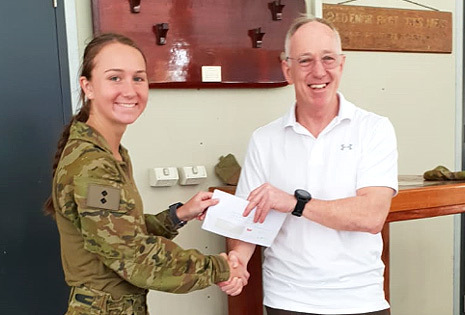 At the end of our Leadership and Team Building Day (AKA the Zombie Apocalypse see our News Page November 2018) as a way of giving back to the those who have helped us and helped the 2nd Combat Engineer Regiment, Gripfast donated $2000 to Brisbane Legacy. 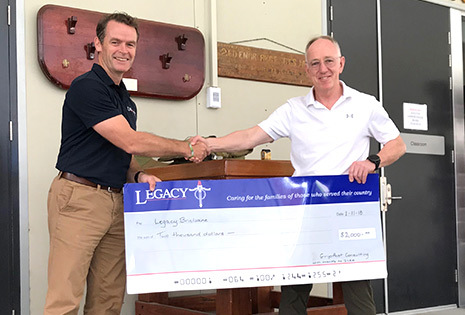 Legacy is a charity providing services to Australian families suffering after the injury or death of a spouse or parent, during or after their defence force service. This includes some families from 2CER. While working with 2CER to develop the Leadership day we became aware that some members of the unit were battling cancer. So, we also chose to make a $2000 donation to the Australian Cancer Research Foundation who aim to accelerate significant breakthroughs in cancer diagnosis and treatment by providing world-class scientists with the equipment they need to improve prevention, diagnosis and treatment of cancer. Gripfast's celebrated its first full year of trading with traditional Christmas drinks with the team, clients, and business associates. Rather than giving clients gifts, the GRIPFAST Directors chose to give donations. 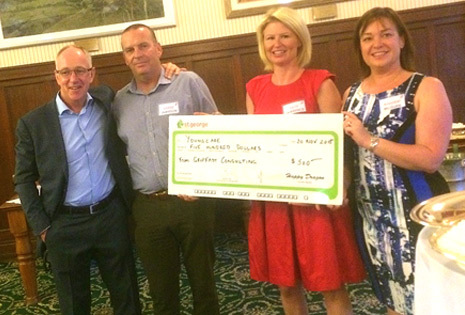 Youngcare is a not-for-profit company building homes for young people with high care needs and an organisation that GRIPFAST works closely with. The Youngcare staff were not aware that they would be receiving anything on the evening, so were caught off guard but elated to be receiving such a substantial donation to the cause we all work so hard for. 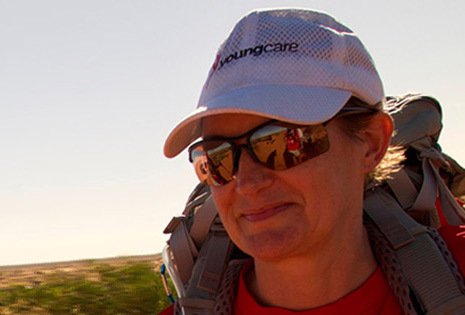 Gripfast has agreed to sponsor Samantha Kennerley, Youngcare’s CEO for the 2016 Simpson Desert trek. In what is the ultimate Australian adventure challenge, for eight days between Thursday, 28 April and Sunday, 8 May 2016, 18 bold trekkers will conquer harsh weather conditions and endless sand dunes whilst walking more than 250 kilometres across the Simpson Desert. And it’s all for an important reason; right now, 7,000 young Australians with high care needs are living in aged care simply because there are few other options to receive dignified, relevant and age-appropriate care and housing. Youngcare work to create real choices in care and age-appropriate accommodation for young Aussies with high care needs. In lieu of sending Christmas gifts to our clients GRIPFAST also made a special donation to Multiple Sclerosis (MS) QLD. This donation was specially organised to be delivered at MS QLD’s Dutton Park office during a small presentation involving members of the MS QLD team and their CEO Lincoln Hopper. 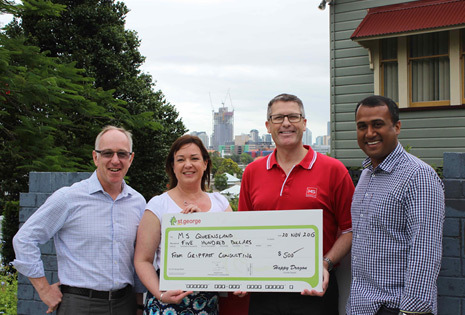 They were surprised when David, Annabel and Jeevan began to present them with the giant cheque outlining GRIPFAST’s donation to the cause and work that MS QLD does. David has been a long standing volunteer Chapter Council member of AIPM Queensland and part of the executive leadership team for the past 5 years. In September 2015 David was elected as the QLD President, a role he will fill for 2 years. In this role David actively promotes the development of project managers and innovative project management practices across a wide variety of sectors. David has also lead the mentoring programme, mentoring three young project managers. 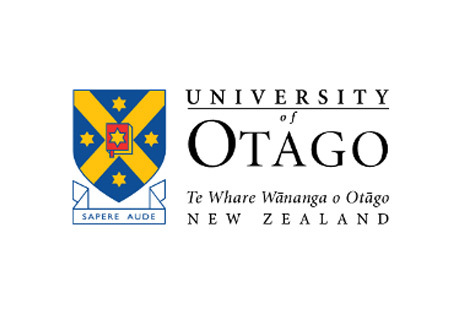 Gripfast also provides work experience for project managers studying at university. 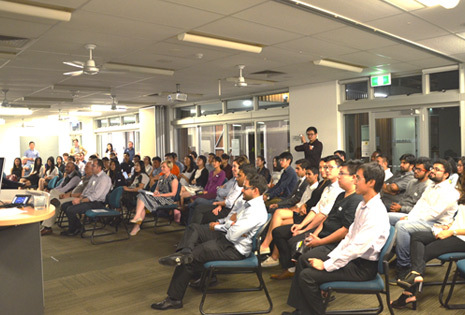 In 2015 David was responsible for organising the QLD State Forum and Project Management Jobs Fair as well as the Project Management Achievement Awards in 2014 and 2015. David has also volunteered as an Assessor for the Awards over the last three years. David is a long standing volunteer for AIPM, a member of the National Board since 2017 and he was the QLD Chapter President from 2015. On the Board he leads the Future Project Leaders Initiative where he actively promotes the development of project managers and innovative project management practices across a wide variety of sectors. Gripfast also provides work experience for project managers studying at university. In 2015 David was responsible for organising the QLD State Forum and Project Management Jobs Fair as well as the Project Management Achievement Awards in 2014 and 2015. David has volunteered as an Assessor for the Awards. During her summer holidays Skye decided to partake in charity work in Guang Dong Province China. Skye taught language skills to young orphaned children with high care needs. She was responsible for helping them with pronunciation and communication skills. Skye was inspired by her initial works with GRIPFAST, which involved project management tasks for Youngcare, and subsequently interacted with people with high care needs. Not only did Skye aid in the teaching and learning techniques of the Chinese language, she was also able to advise the Chinese charity organisation running the orphanage on these skills and techniques. She has a great interest in helping people through the delivery of appropriate housing requirements and is planning to continue her relationship with the Chinese charity organisation, by aiding them with their housing needs. BUCNA is an association that assist students studying Construction, Project Management, Property, Architecture, Sustainable Environment and Planning by developing relationships between students and industry. This is done by building bridges between students and industry by enhancing students’ understanding of industry needs, career prospects and networking skills. Ryan is the President of BUCNA and works closely with students, faculty and built environment industry professionals. BUCNA hosts various events such as skill workshops (i.e. networking skills), industry information forums and networking functions. BUNCA has been a great contributor to both students and built environment professionals with multiple students up skilling and gaining work placements through industry representatives.